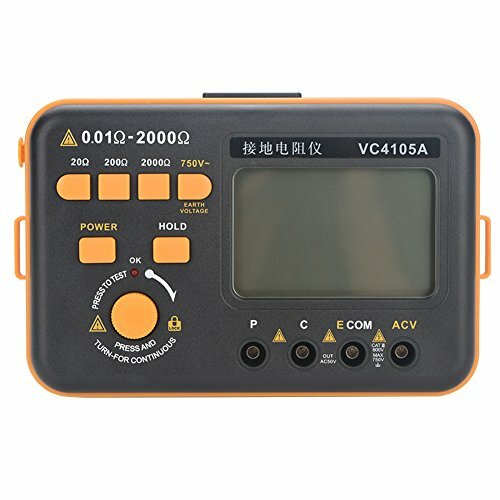 High Quality Materia VC4105A Earth Resistance tester is a professional instrument in dectecing ground resistance of the electrical equipments. Upgraded from the traditional ground resistance meter with its circuit, structure and technics. Now present as fashionable, precise and easy operational.Thanks to robust housing, compact inner structure, This Resistance Meter offers the perfect features of drop-resistance and super long lifespan. Easing Reading LCD display shows measured data and unit symbols.78x50mm(3*2 inches) display window LCD display, large-screen display value for your reading. The maximum display 1999 is more accurate.Overload indication: Show as1 when input overload.support low battery indication. Range Selection Switch 20 /200 /2000 /EARTH VOLTAGE.More choices, you can choose the measurement range you want, so that you can use in many situations.Also accessible for AC current measuring.Powered by 8 AA 1.5V alkaline batteries (NOT included). Easy To Use Self-locking measurement button:Press the test button from the bottom right to start the test. HOLD is a Digit hold switch,POWER is a Self-locking type power switch .Test working indication light: When testing right wiring this light will turn on. 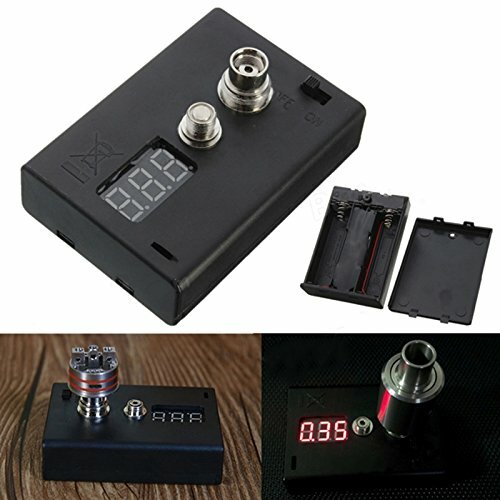 Designed for testing resistance and voltage of e-cigarette products. Can be used for testing devices with thread of EGO 510 808D, M7 M8, etc. 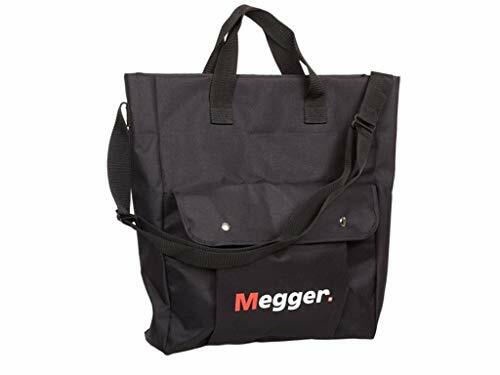 The Megger 18313 carrying case is a soft tote bag for storing and transporting Megger digital low-resistance test leads. It has a front pocket with snaps for organizing small pieces, and it comes with a carrying handle and shoulder strap for one-handed or hands-free carrying. Megger manufactures equipment for cable fault locating, protective relay testing, telecommunications and data integrity, and power quality testing under multiple brand names, among them Megger, Biddle, States, and AVO. The company, founded in 1889, is headquartered in Dover, England, and meets International Organization for Standardization (ISO) 9001:2008 standards. View larger 110V Precision Milliohm Meter Compact and precise, the Extech 380460 Milliohm Meter has 5 ranges and measures down to 0.1 milliohms using 4-wire Kelvin clip test leads. Measurements are displayed on the unit's large 0.7-inch 1999 count LCD. Other Features A durable field service housing with protective cover, overrange indication and manual zero display adjust. Operates on 110VAC 60 Hz and comes complete with 4-wire cables with Kelvin clip connectors. CAT II-230V safety category. What is a MilliOhm? The units of measure for resistances less than 1 Ohm ( ) are Milli- (m ) and Micro-( )Ohms. One MilliOhm (1m ) is equal to one thousandth of an ohm (0.001). One MicroOhm (1 ) is equal to one millionth of an ohm (0.000001). For example, 0.5 ohms (one half an ohm) is equal to 500m . Why bother measuring resistances so low? It may seem like too small a resistance to be of any consequence but many safety standards (UL, CSA, VDE, etc.) require that such resistances be measured during the manufacture of consumer products, hand tools, and many appliances. A good example is the testing of kitchen appliances. 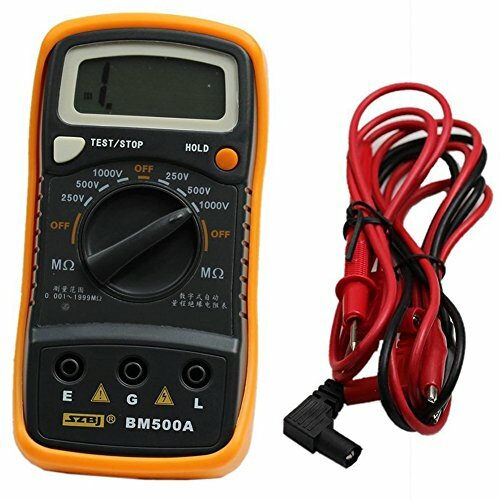 Why are 4-wire connections required when making milliohm measurements? Test leads always introduce a small amount of additional resistance into a measurement. This is acceptable in non-critical measurements such as megohm resistances. However, when measuring milliohms in a critical application, any additional resistance can render the measurement useless. This is why 4-wire (Kelvin) connections are imperative. 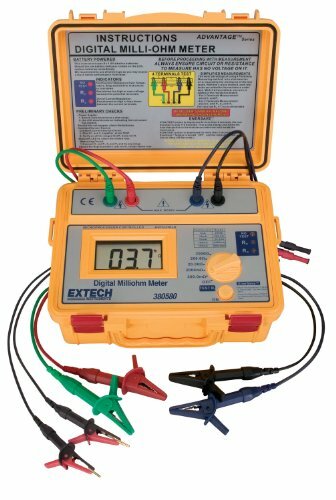 More Extech Instruments to Choose From View larger 380462 220-Volt Precision Milliohm Meter Precision Milliohm Meter has 5 ranges and measures down to 0.1 milliohms using 4-wire Kelvin clip test leads. Measurements are displayed on the large 0.7-inch 1999 count LCD. Additional features include a durable field service housing with protective cover, overrange indication and manual zero display adjust. Operates on 220 VAC 50 Hz and comes complete with 4-wire cables with Kelvin clip connectors. CAT II-230V safety category. View larger 380580 Battery Powered Milliohm Meter Battery operated Milliohm Meter has 5 ranges and measures down to 0.1 milliohms. Measurements are displayed on a large, 2000 count LCD. Additional features include over-temperature and over-voltage protection, Auto-Hold, Auto power off, and invalid test indicators to prevent inaccurate measurement. Unit is housed in a built-in water resistant case and comes complete with eight AA batteries, and two sets of test leads (4-wire with four alligator clips and 4-wire with two Kelvin alligator clips). View larger 380560 High Resolution Precision Milliohm Meter Benchtop Milliohm Meter has 7 ranges and measures down to 0.01 milliohms. Measurements are displayed on a 1999 count display with 0.8-inch digits. Additional features include: automatic zero, 5V test voltage, and a built-in comparator for Hi/Lo/Go resistance testing or selection. Operates on 110VAC and comes complete with 4-wire cables with Kelvin clip connectors. View larger 380562 220-Volt High Resolution Precision Milliohm Meter Benchtop Milliohm Meter has 7 ranges and measures down to 0.01 milliohms. Measurements are displayed on a 1999 count display with 0.8-inch digits. Additional features include: automatic zero, 5V test voltage, and a built-in comparator for Hi/Lo/Go resistance testing or selection. Operates on 220 VAC and comes complete with 4-wire cables with Kelvin clip connectors. View larger High Resolution Precision Milliohm Meter Compact and precise, the Extech 380560 Milliohm Meter has 7 ranges and measures down to 0.1 milliohms using 4-wire Kelvin clip test leads. Measurements are displayed on the unit's large 0.8-inch, 1999-count LCD. Other Features Automatic zero, 5V test voltage, and a built-in comparator for Hi/Lo/Go resistance testing or selection. Operates on 110VAC and comes complete with 4-wire cables with Kelvin clip connectors. 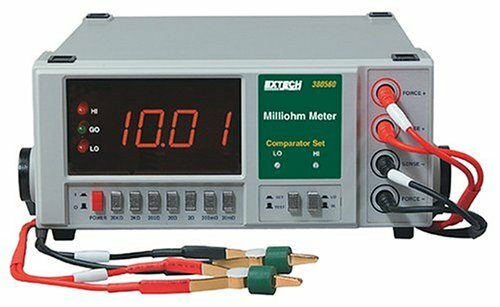 More Extech Instruments to Choose From View larger 380562 220-Volt High Resolution Precision Milliohm Meter Benchtop Milliohm Meter has 7 ranges and measures down to 0.01 milliohms. Measurements are displayed on a 1999 count display with 0.8-inch digits. Additional features include: automatic zero, 5V test voltage, and a built-in comparator for Hi/Lo/Go resistance testing or selection. Operates on 220 VAC and comes complete with 4-wire cables with Kelvin clip connectors. View larger 380460 110-Volt Precision Milliohm Meter Precision Milliohm Meter has 5 ranges and measures down to 0.1 milliohms using 4-wire Kelvin clip test leads. Measurements are displayed on the large 0.7-inch 1999 count LCD. Additional features include a durable field service housing with protective cover, overrange indication and manual zero display adjust. Operates on 110VAC 60 Hz and comes complete with 4-wire cables with Kelvin clip connectors. CAT II-230V safety category. View larger 380462 220-Volt Precision Milliohm Meter Precision Milliohm Meter has 5 ranges and measures down to 0.1 milliohms using 4-wire Kelvin clip test leads. Measurements are displayed on the large 0.7-inch 1999 count LCD. Additional features include a durable field service housing with protective cover, overrange indication and manual zero display adjust. 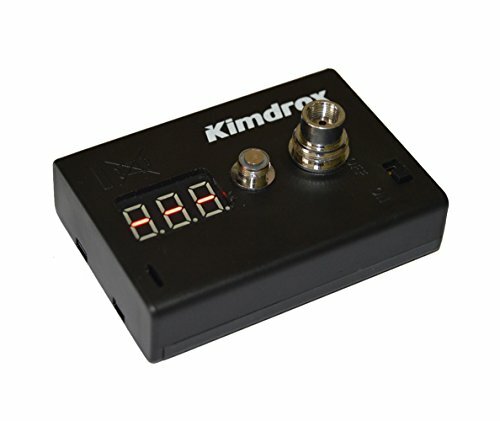 Operates on 220 VAC 50 Hz and comes complete with 4-wire cables with Kelvin clip connectors. CAT II-230V safety category. 7 resistance ranges measure from 200m? to 20k? High resolution down to 0.01m? Any product questions, please contact us! We sincerely hope that we can give our customers 100% product and services. The AEMC 6240 digital microohm meter with data analysis software is a manual-ranging four-input meter with six test current and resistance ranges for precise, low-resistance measurements from 1 microohm ( ) to 400 ohms ( ) of switches, relays, test wires, cables, printed circuit boards, and other electrical components. Four input terminals enable Kelvin-type, four-wire resistance measurements, which are more accurate than two-wire resistance measurements. The meter includes PC software for configuring the meter, storing and analyzing data, generating reports, and performing temperature compensation of readings. The software is compatible with Windows XP, Vista, 7, and 8, and requires at least 80MB of hard disk space. A cable with USB connector is included for connecting from the meter's optical interface to a PC. The meter's memory function allows storage of up to 99 readings. The polarity reversal function improves reading accuracy by compensating for interference from thermal electromagnetic fields (EMF). When measurement is complete, residual voltage will be automatically discharged from the device under test. Built into a sealed field case, the meter has a 4,000-count LCD with a backlight for visibility in low light. It operates on a rechargeable 6-volt nickel-metal hydride (NiMH) battery pack (included) and has a low-battery indicator that signals when the battery needs to be recharged. 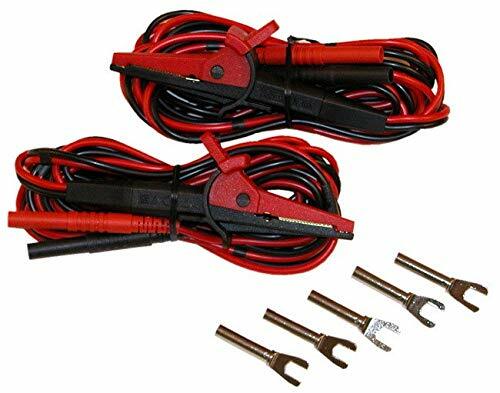 It comes with a set of test leads with Kelvin clips, data analysis software, a pad of 50 test results forms, an interface cable with USB and optical connectors, a 115V power cord, two 12.5A replacement fuses, a carrying bag, and instructions. Milliohm meters are commonly used for electrical maintenance and testing in industries such as heating, ventilation, and air conditioning (HVAC), transportation, telecommunications, power plants, and utilities, among others. This manual-ranging meter allows the user to select the operating range for measurements. Accuracy and resolution specifications vary according to the range being measured. It meets European Standard (EN) safety standard 61010-1 and is rated for category III installations to 50 volts, which covers equipment in fixed installations, such as switches in the fixed installation and some industrial equipment that is permanently connected to the fixed installation, and category II installations to 300 volts, which covers energy-consuming equipment connected to a fixed installation, including household, office, and laboratory appliances. It has European Conformity (CE) marking. Specifications Resistance measured 1 to 400 Test current/resistance ranges 10A/4,000 , 1A/40m , 1A/400m , 100mA/4,000m , 10mA/40 , 10mA/400 Installation rating Category III, 50V; category II, 300V Standards met European Standard (EN) safety standard 61010-1; European Conformity (CE) marking Power supply Rechargeable 6V nickel-metal hydride (NiMH) battery pack Weight 4.5kg/10 lbs. Dimensions (H x W x D) 248 x 272 x 182mm/9.76 x 10.7 x 7.17 H is height, the vertical distance from lowest to highest point; W is width, the horizontal distance from left to right; D is depth, the horizontal distance from front to back. Ohmmeters measure resistance to the flow of current in an electrical component or circuit and check the continuity of an electrical circuit to detect electrical problems such as degraded insulation and improper circuit connections in equipment, wiring, and power supplies. Resistance is an indicator of the overall condition of the device being tested. Microohm meters and milliohm meters measure small resistance values, and megohm meters (also known as megaohm meters, or insulation resistance meters) measure large resistance values. Ohmmeters have an internal power supply, such as a battery or a capacitor, which supplies current to a circuit or component that is turned off. Test leads are connected in a series to the meter and the circuit or device being tested. As current flows through the circuit or device, the meter calculates the difference in voltage between the leads and measures the resistance. Ohmmeters have either two or four input terminals for test lead attachment. The two-terminal, or two-wire, measurement method provides measurements that include the resistance of the circuit or device being tested and the resistance of the test leads. Megohm meters generally use the two-wire method because it provides sufficient accuracy for measuring large values of resistance in insulation testing applications. The four-wire method eliminates resistance from the test leads and measures only the resistance of the circuit or device being tested. Milliohm and microohm meters generally use the four-wire method because it provides a greater degree of accuracy for measuring smaller values of resistance in low-resistance applications. 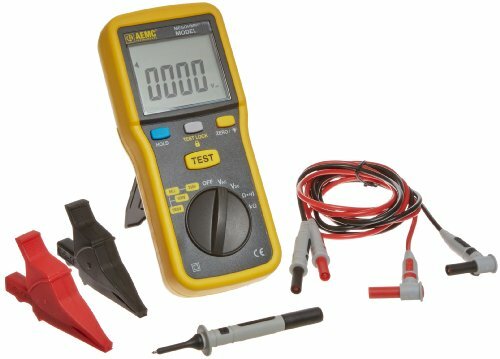 AEMC Instruments manufactures electrical testing and measurement instruments, including clamp meters, power quality analyzers, ground resistance testers, and data loggers. The company, founded in 1893, is headquartered in Foxborough, MA. The whole instrument is stylish and superior grade in appearance and highly stable in performance. It can be operated by both hands through using a shoulder strap. It is most suitable for the needs of insulation resistance check, such as electric, cable, electrical and mechanical equipment, telecommunication equipment and electrical facilities. The batteries are not included in the package due to Aviation Security Check. Please purchase suitable batteries locally. Sorry for any inconvenience caused. Full function protection, anti high voltage circuit design. 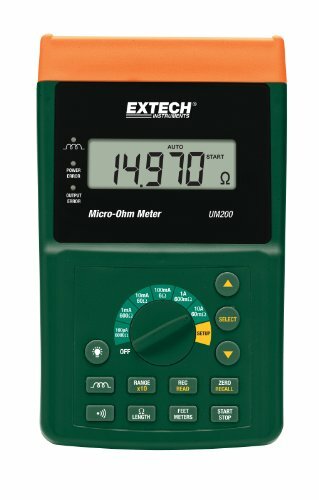 Battery Powered Milliohm Meter Battery operated to facilitate in-the-field use, Extech's 380580 Milliohm Meter provides five resistance ranges with resolution as low as 0.1 milliohms, and the 4-wire Kelvin clip connection provides optimum accuracy. Typical applications include transformer, motor coil, and PC board resistance measurements. Additional Features Measurements are displayed on a large, 2000 count LCD. Additional features include over-temperature and over-voltage protection, Auto-Hold, Auto power off, and invalid test indicators to prevent inaccurate measurement. What's in the Box Unit is housed in a built-in water resistant case and comes with eight AA batteries, two sets of test leads (4-wire with four alligator clips and 4-wire with two Kelvin alligator clips), and user manual. 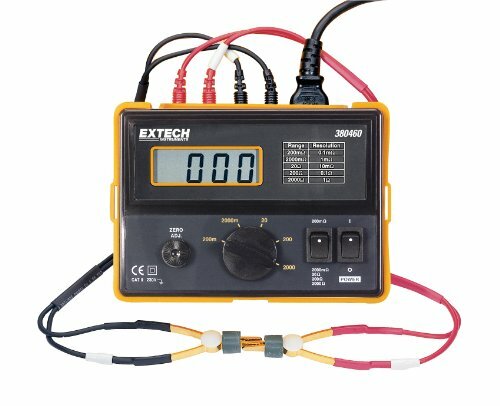 More Extech Instruments to Choose From View larger 380460 110-Volt Precision Milliohm Meter Precision Milliohm Meter has 5 ranges and measures down to 0.1 milliohms using 4-wire Kelvin clip test leads. Measurements are displayed on the large 0.7-inch 1999 count LCD. Additional features include a durable field service housing with protective cover, overrange indication and manual zero display adjust. Operates on 110VAC 60 Hz and comes complete with 4-wire cables with Kelvin clip connectors. CAT II-230V safety category. 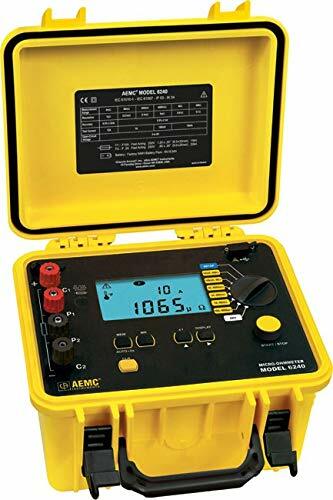 The AEMC 6501 hand-cranked analog megohmmeter is an auto-ranging insulation tester with a 500V test voltage for measuring insulation resistance to 200M to indicate the condition of windings or cables in motors, switchgears, electrical installations, and other insulated equipment, and it also measures low-resistance to 500k and AC and DC voltage to 600V for confirming that the circuit under test is fully discharged and not connected to a live circuit. Powered by a hand-cranked generator, the meter reaches the test voltage at approximately 140rpm, illuminating an LED to indicate that the necessary test voltage and crank speed are present for a valid reading. When measurement is complete, residual voltage is automatically discharged from the circuit under test. The meter has an analog scale with a needle pointer. This auto-ranging meter automatically selects the appropriate operating range for measurements. When the pointer reaches about 90% of the scale capacity, the auto-range triggers, resetting the needle to the beginning of the scale and lighting an LED to indicate that subsequent readings should be multiplied by ten. The meter is rated for category (CAT) III installations to 300V, which covers energy-consuming equipment connected to a fixed installation, including household, office, and laboratory appliances and CAT II installations to 600V, which covers energy-consuming equipment connected to a fixed installation, including household, office, and laboratory appliances. It comes with a set of test leads, a set of alligator clips, a test probe, a soft carrying case, and instructions. 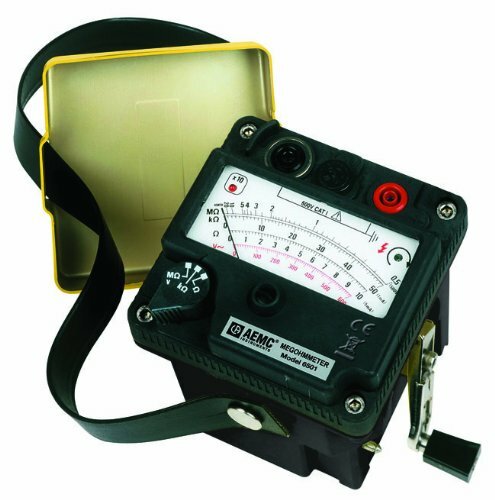 Megohmmeters are commonly used for electrical maintenance and testing in industries such as HVAC, transportation, manufacturing, mining, and utilities, among others.
. Megohmmeters, also called insulation testers, are electrical test meters that measure resistance to the flow of current in an electrical component or circuit and check the continuity of an electrical circuit to detect electrical problems such as degraded insulation and improper circuit connections in equipment, wiring, and power supplies. Resistance is an indicator of the overall condition of the device being tested. Megohmmeters have an internal power supply, such as a battery or a capacitor, which supplies a test voltage to a circuit or component that is turned off. Test leads are connected in a series to the tester and the circuit or device being tested. The meter calculates the difference in voltage between the leads and measures the resistance. Most megohmmeters have two terminals for test lead attachment. 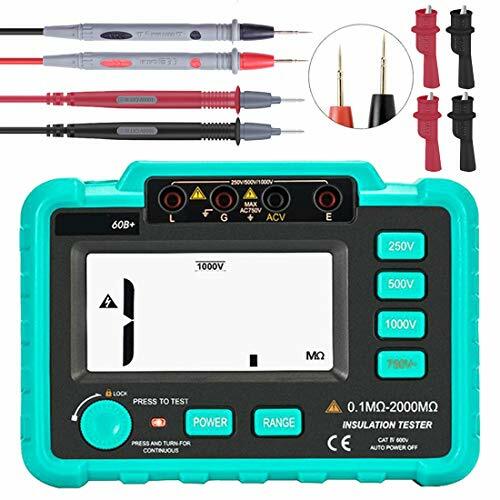 The two-terminal, or two-wire, measurement method includes the resistance of the circuit or device being tested and the resistance of the test leads, and generally provides sufficient accuracy for measuring large values of resistance in insulation testing applications. AEMC Instruments manufactures electrical testing and measurement instruments, including clamp meters, power quality analyzers, ground resistance testers, and data loggers. The company, founded in 1893, is headquartered in Foxborough, MA. Ohmmeters measure resistance to the flow of current in an electrical component or circuit and check the continuity of an electrical circuit to detect electrical problems such as degraded insulation and improper circuit connections in equipment, wiring, and power supplies. Resistance is an indicator of the overall condition of the device being tested. Microohm meters and milliohm meters measure small resistance values, and megohm meters (also known as megaohm meters, or insulation resistance meters) measure large resistance values. Ohmmeters have an internal power supply, such as a battery or a capacitor, which supplies current to a circuit or component that is turned off. Test leads are connected in a series to the meter and the circuit or device being tested. As current flows through the circuit or device, the meter calculates the difference in voltage between the leads and measures the resistance. Ohmmeters have either two or four input terminals for test lead attachment. The two-terminal, or two-wire, measurement method provides measurements that include the resistance of the circuit or device being tested and the resistance of the test leads. Megohm meters generally use the two-wire method because it provides sufficient accuracy for measuring large values of resistance in insulation testing applications. The four-wire method eliminates resistance from the test leads and measures only the resistance of the circuit or device being tested. Milliohm and microohm meters generally use the four-wire method because it provides a greater degree of accuracy for measuring smaller values of resistance in low-resistance applications. 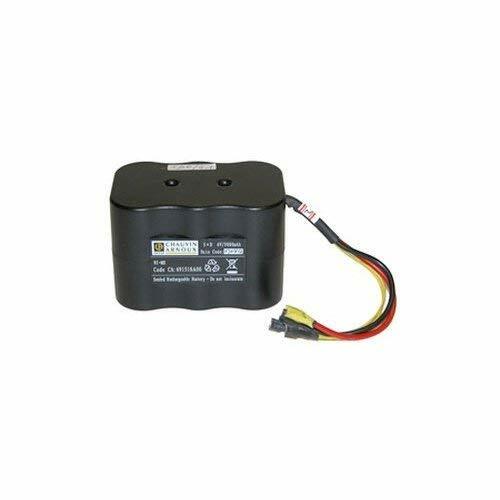 NiMH 6.5V 8.5AH Rechargeable battery fits for micro-ohmmeter. 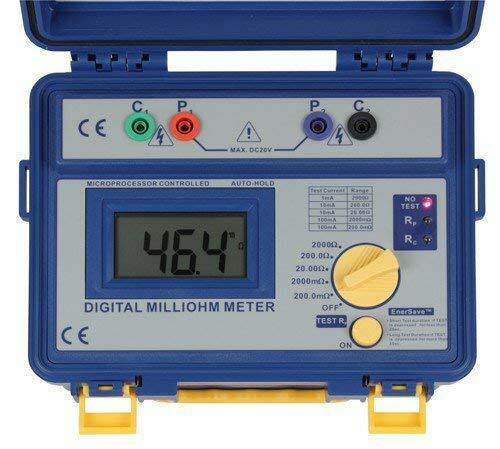 The model 310 Digital Milli-Ohm Meter is used to ensure continuity and integrity of a wire, cable, conduit or any electrical connection. The 310 has a display resolution of 100 micro-ohms and has a professional four wire Kelvin test lead set included to ensure accurate readings. The heavy duty case has a rubber seal to make the unit water resistant and a convenient shoulder strap.